This classic, easy Vanilla Cupcake Recipe is soft, springy, and can be prepped and baked in under 30 minutes! My vanilla cupcakes are moist with a soft crumb and are made with all butter and no oil for the best buttery flavor. Sweet but light and crowned with a decadent, whipped chocolate buttercream frosting, I think you’ll love these! My typical reaction to being offered a vanilla cupcake is to not-so-subtly glance over the dessert table to check if there are any chocolate cupcakes available before accepting. If there aren’t, I’ll graciously (and totally gracefully, I’m sure) devour one. I’m not exactly the kind of person to turn down sugar, after all, but vanilla has never been my go-to flavor. But every good baker needs a good vanilla cupcake recipe, and this space was lacking one. Yeah, I have a vanilla cake that many people have successfully converted into cupcakes, but I wanted something a little different to share. But it needed to be good. Really, really, really good. After months of working to perfect this recipe, about 8 Google Doc pages full of notes, and multiple test runs past my taste-testers, this is it. With its light, moist crumb, its buttery, vanilla-infused flavor, this vanilla cupcake recipe is my new go-to. Like, I would actually pass up a chocolate cupcake for one of these. Butter. Often when making cupcakes I like to use oil for the best texture and a moist cake. This cupcake recipe, however, was carefully crafted to be made with all butter and still be perfectly soft and moist with a light, flavorful crumb! Brown Sugar. We’re using both granulated and brown sugar. The brown sugar will make the cupcakes slightly heavier and it enriches the flavor and makes them more moist. I love the addition but if you don’t have brown sugar handy this vanilla cupcake recipe will also work if you substitute more granulated sugar for the brown sugar. Eggs. Just one is all you need, actually. Vanilla Extract. We’re using a generous 1 1/2 teaspoons for 12 cupcakes. 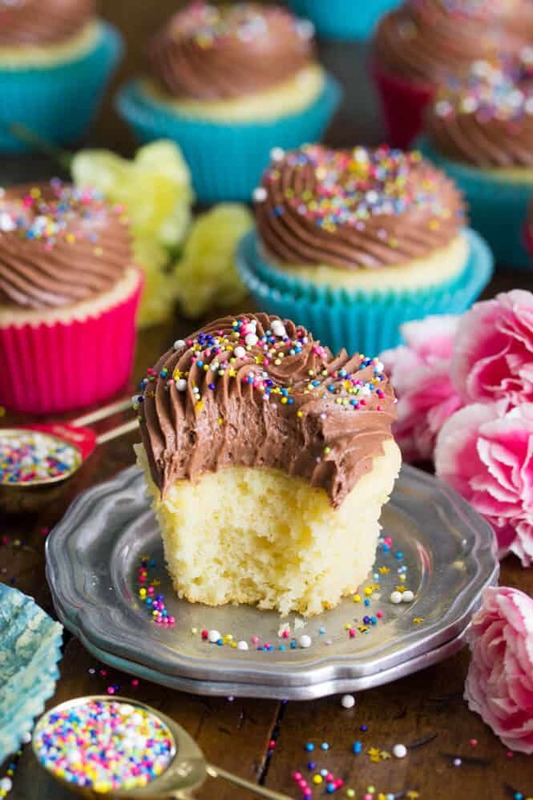 These cupcakes have a great vanilla flavor (but it’s not overpowering). Flour. I use all-purpose flour, cake flour can be substituted. Buttermilk. 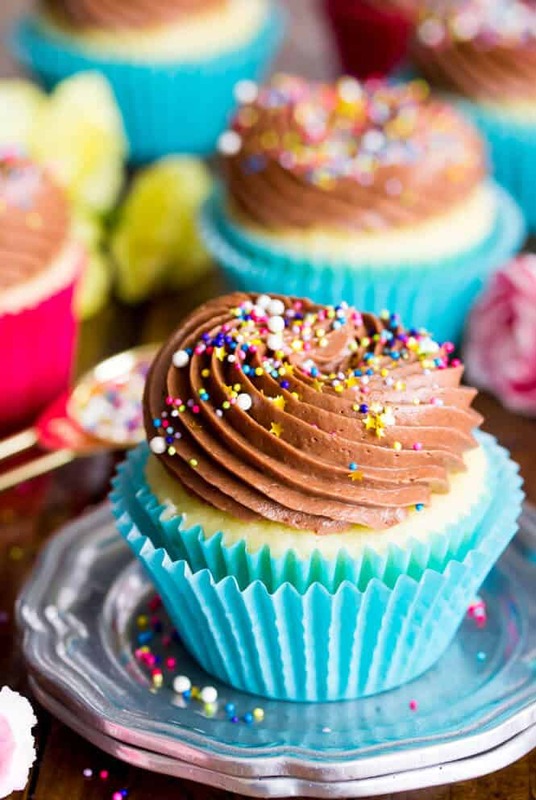 Another key ingredient that helpsmakes these vanilla cupcakes soft and moist. If you don’t have buttermilk handy, you can make my easy buttermilk substitute instead. 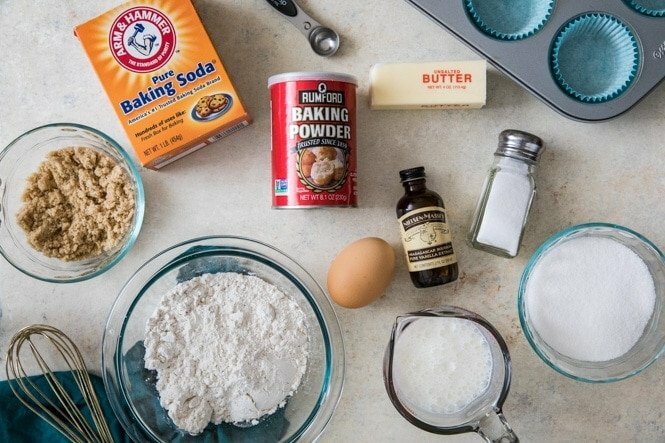 That’s literally all you need for these perfect vanilla cupcakes. They results are delicate and light but still sturdy enough to hold a heavy crown of chocolate frosting. They’re moist and sweet without being over-sweet, they’re just all around perfect, honestly. My vanilla cupcakes are easy to make, and practically fool-proof. Cream together butter and sugars. These ingredients should be beaten together until well-combined and light and fluffy. Stir in egg and vanilla extract. Make sure these are well incorporated. Whisk together dry ingredients in a separate bowl. Portion into 12-count muffin tin and bake. While you’ll need to stir the ingredients by hand for the second half of the recipe, you will need a a stand mixer or electric hand mixer for the first half. Creaming together the butter and sugars is critical for the best light and fluffy texture, and it’s not easy (possible?) to properly do this by hand. What Makes a Cupcake Moist and Fluffy? There are actually quite a few things that go into this, but I wanted to share the top three things that help make your vanilla cupcakes moist and fluffy. This helps your ingredients to combine properly when mixing. Ingredients of different temperatures will still combine, but they may not end up as well incorporated as you hope, leaving you with an unevenly mixed batter and a cupcake that’s dense. When we cream together our butter and sugar and beat in our egg, we’re creating air bubbles in our batter. These are key for a light moist cupcake. When we add in our flour and buttermilk, we start bursting those air bubbles. If you over-mix at this point and too many of your air bubbles collapse, your cupcakes will be dense and dry. Baking for the right amount of time (and not a minute longer). Vanilla cupcakes will take 17-18 minutes to bake completely. The top should spring back if lightly touched and a toothpick in the center should ideally come out with a few moist crumbs or clean. 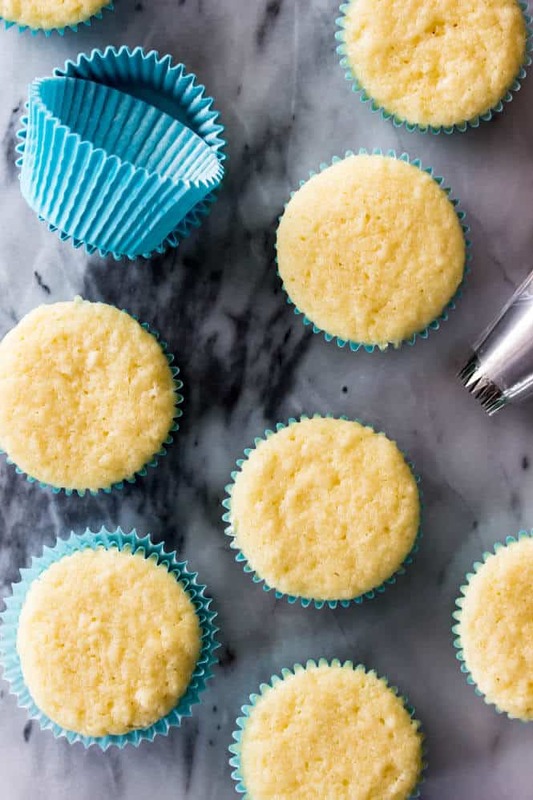 If you leave them in the oven for too long, a toothpick will still come out clean but the cupcakes will be dry and crumbly when you bite into them. Another thing worth noting: make sure your oven is actually at the right temperature. Many ovens are actually not calibrated correctly and run hotter or cooler than they indicate, and this is why I keep several inexpensive thermometers in my oven, to make sure the temperature is correct at all times. If your oven is too hot, it will bake your vanilla cupcakes too fast and dry them out! Whew, are you sick of hearing about vanilla cupcakes yet? Thanks for sticking with me through all that. If you try out this recipe I’d love to know what you think! An easy, perfect vanilla cupcake recipe! 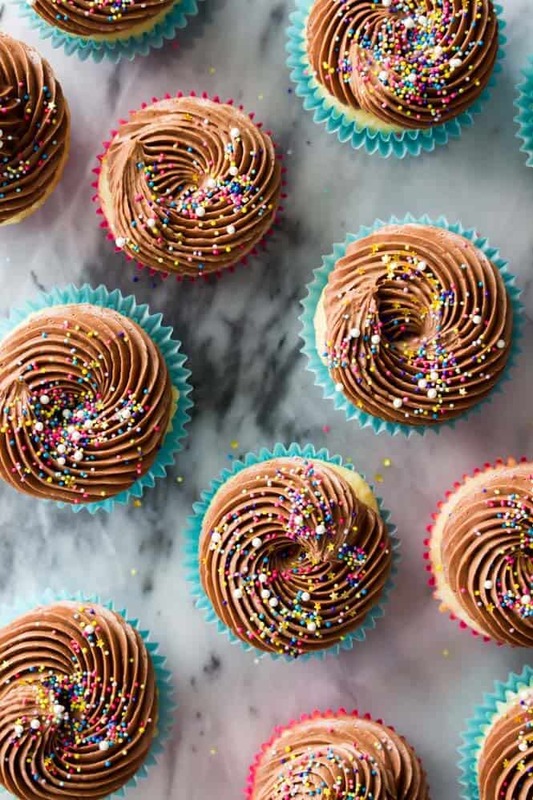 Soft, springy, and buttery, these cupcakes can be whipped up in under 30 minutes. Don't forget to check out my new recipe VIDEO at the bottom of the post! Preheat oven to 350F (175C) and line a 12-count muffin tin with paper liners. Set aside. Combine butter and sugars in the bowl of a stand mixer (or in a large bowl -- and use an electric hand mixer) and beat on medium speed until well combined and light and fluffy. Remove butter/sugar mixture from stand mixer and use a spatula to gradually fold in about 1/4 of the flour mixture until just combined. Continue to alternate until flour mixture and buttermilk are completely combined -- mix thoroughly but be sure not to over-mix or your cupcakes could end up dense and dry. 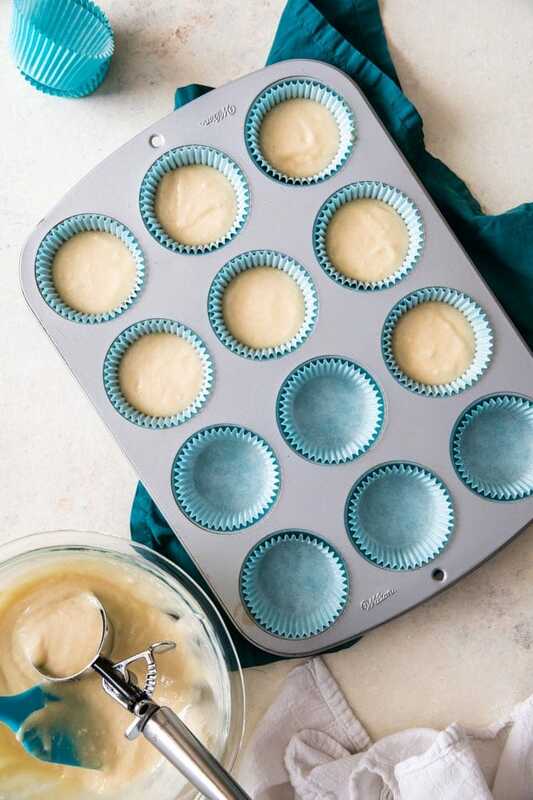 Fill cupcake liners 2/3-3/4 of the way full with batter (do not over-fill) and bake on 350F (175C) for 17-18 minutes or until tops spring back when gently touched (the tops will be fairly flat, these do not puff up in the oven like muffins) and a toothpick inserted in the center comes out with a few moist crumbs or clean. In a microwave-safe bowl, microwave chocolate chips at 15 second intervals, stirring between intervals, until chips are completely melted. Set aside and allow to cool slightly (about 10 minutes, stirring occasionally). Cream room temperature butter with an electric mixer. Stir in slightly cooled chocolate and beat well. Gradually add sugar, scraping down the sides and bottom of bowl occasionally. Gradually add heavy cream, increase speed to high and beat for 1 minute, pausing halfway through to scrape down sides of bowl. Spoon frosting into a piping bag fitted with tip of choice (I used a large French tip) and pipe on cooled cupcakes. I originally shared this Vanilla Cupcake Recipe 05/15/2017. Post has been updated and a video added 03/25/2019. The recipe remains the same; even though I tried to improve upon it I found it was pretty much perfect as written! I loved this recipe! I’ve used it several times and everyone loves them! Is it possible to use the recipe for a cake? Okay, your blog has ruined me for good now. 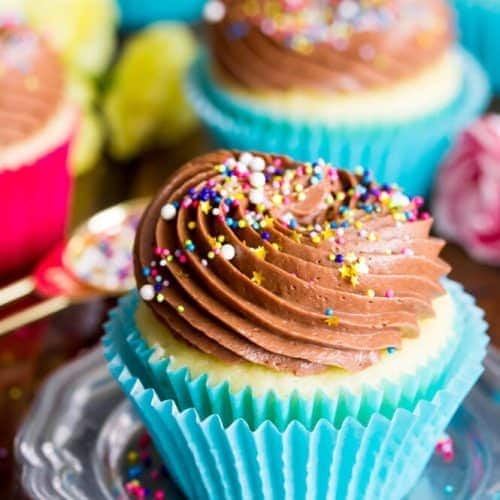 This is the second recipe of yours I’ve tried, and is also one of the absolute best cupcakes I’ve ever eaten–and I hate vanilla cupcakes! Thank you for putting the science behind everything in your posts too, I never would have thought about butters melting sugars and the effects it has, but it seems so obvious now. I can’t wait to try more and continue to spam your blog with comments about how fat my loved ones and I are getting! Hello.can i prepare them and put the frosting a day before the party? Or the frosting must be put on the same day.? I’m hoping to make these for my daughter’s birthday party. How many days ahead of time can they be made and should I refrigerate them? Thanks in advance. I am looking to make mini cupcakes. Do you have a suggestion for the bake times for mini cupcakes? I am not a baker, do you think I should start checking them at 10 mins? Thanks My daughter and I can’t wait to try out this recipe. We made your vanilla cake and it was fabulous! I split the recipe between mini and regular sized cupcakes. For my oven the regular size took 18 mins. For the mini ones, they took 12 mins. So I would recommend checking starting at 10 mins depending on the oven. These cupcakes sound amazing, Sam! I love that frosting! These cupcakes look beautiful! I am a cake fan, not a frosting fan, but even the frosting looks good. What size scoop do you use to fill your cupcake tins? 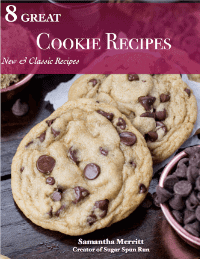 I would like to make this recipe gluten free and have gluten free flour. Any other recommendations to insure they come out moist? Hi Tiffany! Unfortunately, I am not familiar with baking with gluten free flour so I can’t provide any advice here. I’m sorry. 🙁 If you try it, let me know how it turns out please.